Ahhh what a relief that it’s Friday again. This weekend I have BIG plans that include building a bookcase for my handbags and shoes (sounds ridiculous but my closet is getting too small)! I’m also looking forward to more good weather this weekend – it’s been crazy nice in Dallas this week – and this is one of my favorite weekend outfits these days. 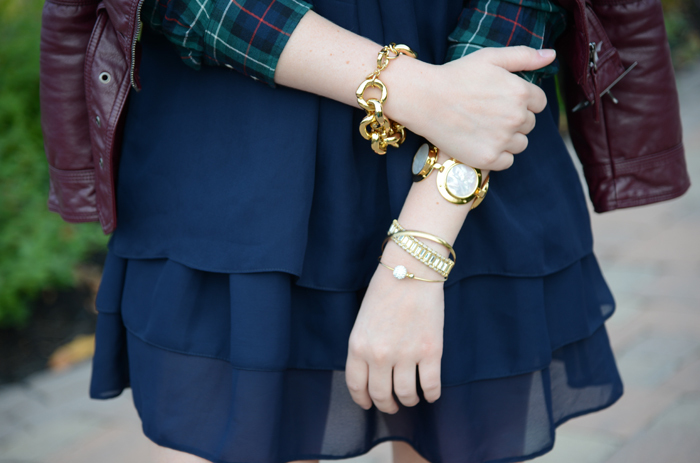 I’m loving the plaid and tartan trends for fall and decided this J.Crew shirt is a great example of it. It has all of the season’s hottest hues: navy, green and burgundy, which I’ve brought out with my H&M and new ASOS dress. So wearable and easy to dress up with lots of fun jewels or keep casual with jeans and boots. LOVE the shirt! I have a burgundy version and it is such a staple, this season. Have fun with the closet reno this weekend…you just gave me an idea (I’m running out of space too)!! You seriously have the best taste in the way you put your outfits together! I live in Arizona wear its still over 90 degrease some days. This look is very “fall” but doesn’t look like its hot to wear. You are beautiful and your style is impeccable!! Loves!